“In as much as fund” Fundraiser. 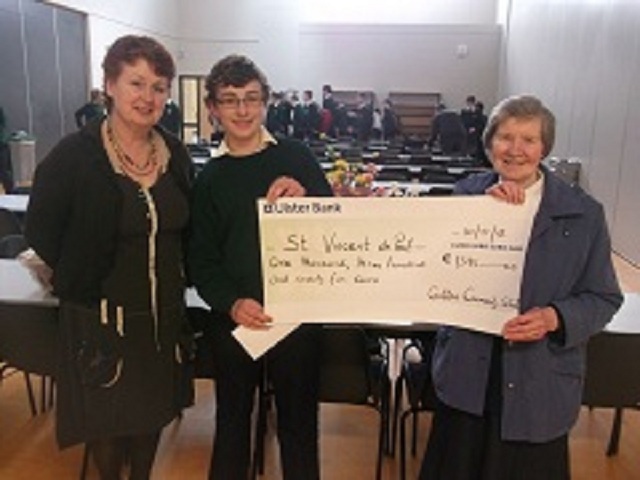 Last Friday saw the proceeds from the “In as much as Fund” – (Gallen CS’s annual fundraiser) go to the Ferbane branch of St Vincent de Paul. Sr. Joseph, on behalf of Sr. Benedict and the local branch of Vincent de Paul was delighted to receive a cheque for €1375 raised by the students. She thanked Mrs Breen and students for their efforts in raising this money and assured the students that the money will be redistributed to help many families around the Ferbane area. 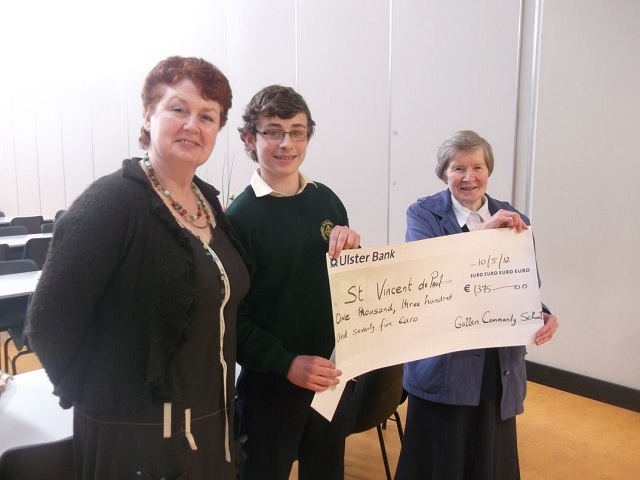 Conor Mannion in second year (pictured with Mrs Breen and Sr. Joseph) was the student who collected the most money this year. Congratulations to the students who participated in and won honours in the Offaly Fleadh yesterday . In the u 18 category Clare Ann Keans won First in Fiddle, Fiddle Airs, and Piano. Ruth Hennessey on Fiddle won joint first with Clare Ann in the Duet. Ruth came second in u18 Fiddle. Chloe Flynn came second in the u18 Button Accordian and third in the Flute. Chloe also plays the flute in two bands both which won first. The ceile band “Lana Eile” came first as did her grupa ceoil “Tuath na hEiscear”. In the u 15 section Tara Flynn came first on the Button Accordian and Donal Ryan came in third. The four girls will progress to the Leinster Finals in Wicklow in June where we feel sure they will do very well also because of their talent and dedication to practice . Hard work is always rewarded! On Sunday 13th May Jamie Darcy a student in fifth year represented Gallen Community School and his swim club Athlone in the Connaught Swimming Gala held on Sunday May 6th in Longford Sports and Leisure Centre. There were swimmers from eight different clubs taking part in the competition. Jamie took 2 seconds off his personal best in the Butterfly to set the fastest time of the day and received a Gold Medal. He also took 2 seconds off his personal best in the Freestyle to achieve an “A time” and received an “A certificate”. Well done Jamie and continued success in the future. Congratulations also to Barry Rohan in first year and Ronan Hynes second year who travelled to Malta over Easter with the Athlone ADSL Academy. They won their match and the tournment 2-0. Their love of soccer is worth all the hard training that they put in with the Academy . In June some other students will travel abroad also and we will keep a watch on their progress too. Last Friday saw the conclusion of the Leaving and Junior Certificate practical exams with the Leaving Cert Art exam. All of these exams are very important as between 25-40% can be accumulated for these oral and practical exams towards their final result. As part of an assembly last week Mr Irwin and Mrs Finnegan offered their support and encouragement to the Leaving Cert students and wished them the best of luck now as they focus on the final few weeks of revision and preparation. Their Graduation Mass will be on Monday 28th May and then we will have Block revision classes scheduled for them from Tuesday 29th to Thursday 31st. The annual end of year school concert will take place next Thursday night at 7.30 p.m. . Organised by Ms Reynolds head of the Music Department it is a wonderful chance for students to sing, play an instrument and perform for the assembled audience. Any student can take part once they have registered with Ms Reynolds and they do not have to be taking music as a subject in school. Every year the talent is wonderful and it is a most enjoyable night. All are welcome.